Pune, Jan 20: Haryana came as favorites and they duly went back with a bagful of medals from the boxing competition at the Khelo India Youth Games. Riding on the performances of their international boxers, Haryana won 18 gold, 16 silver and 17 bronze for a total of 51 medals from boxing alone. It was the second discipline in which their haul crossed the half-century mark. They had won 24 gold, 16 silver and 18 bronze for a total of 58 medals in wrestling. From wrestling and boxing alone, Haryana won 42 of their 62 gold medals. Of their total of 178 medals, as many as 109 came from these disciplines. The major contributors to Haryana’s success were World Youth participants, who comfortably secured gold medals in their respective categories. The few exceptions included 57kg AIBA World Youth champion Sakshi Choudhary, Nations Cup gold medallist Raj Sahiba and Asian bronze medallist Sachin who crashed out in preliminary stages. However, Youth national bronze medalist Sapna has shown great promise by winning gold in girls’ Under-21 75kg class. In the process, she defeated World Youth bronze medalist Astha Pahwa of Uttar Pradesh. 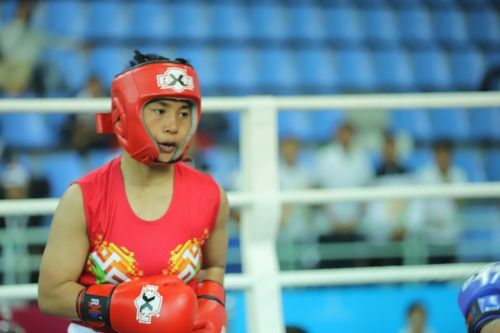 Manipur finished third in boxing with 12 medals, which included two gold, three silver, and seven bronze medals. Out of them, just two bronze came from the boys’ categories. “The girls don’t train elsewhere, and luckily the facilities are increasing at a steady pace in Manipur. So our maximum medals came from the girls’ sections. Of course, we were expecting at least 20 medals from Khelo India, but we will work harder next time,” he added. Maharashtra State Boxing Association secretary Madan Vani said, “It’s true that ASI had a lion’s share in the medal tally. But things are changing at a gradual pace. This time, other civilian pugilists have shown a promising performance like Devika Ghorpade, Mitika Gunele, and Harivansh Tiwari, who train with Krida Prabodhini".